Andrew Carnegie was born on November 25, 1835, in Dunfermline, Scotland. After steam power makes his textile worker father redundant, the family emigrate to the United States. He starts work aged 12, and soon his intelligence secures him a PA position to Pittsburgh rail road President, Tom Scott. When his father dies, Andrew, now 20, becomes the main family breadwinner. Thankfully, he excels at work with innovations such as keeping the telegraph office open 24 hours a day. He’s promoted to manager and oversees railway expansion west. Like many of the rich, he avoids fighting during the Civil War by paying a replacement to fight for him. In 1868, Carnegie employs James Eads, a designer with no bridge building experience, to span the Mississippi at St Louis, Missouri. It will need to be over a mile long, bigger than anything built before it. But if it succeeds, it will connect East and West like never before. One in four bridges built at the time fail. Carnegie invests everything. But the traditional metal, iron, wouldn’t have the tensile strength to withstand the weight of freight carried over the bridge. Steel, the strongest material ever produced (made by mixing iron with carbon at over 2,000 degrees) is however, difficult to mass produce and extremely expensive. At the time, it’s used in small quantities for designer items such as cutlery and jewellery. Carnegie spends years searching for an answer and eventually finds an English inventor, Henry Bessemer, in Sheffield. With his mass-production solution the time it takes to make a single rail goes from two weeks to 15 minutes. Even so, Carnegie falls years behind schedule and is nearly buried in debt. But in 1873, aged just 33, Carnegie unites America with the opening of the St Louis bridge. He still needs to convince people it’s safe to traverse and as there’s a myth that elephants won’t cross unstable structures, he has one walk across it on opening day. Steel orders flood in as the railroad owners seek to replace their tracks with the stronger material. With his old mentor Tom Scott’s help, Carnegie raises $21m in today’s money and builds his first steel plant. The 100 acre steel mill is the country’s largest capable of producing 225 tonnes a day. But when Rockefeller moves his oil off the railroads, he bursts the bubble in the rail road industry. Carnegie suffers in the subsequent stock market crash, but not as much Tom Scott. Disgruntled workers burn Scott’s business down and help to send him to an early grave. So when, in 1881, Carnegie buries his mentor on a rainy day in April, he blames Rockefeller for Scott’s demise and seeks revenge. He’s now producing 10,000 tons of steel a month and making $1.5 million profits per year. And Carnegie finds another massive market. Manhattan land is the most expensive in the world. The only way to expand is up, but materials and current technology mean few buildings exceed five floors. Steel solves this. The first Chicago skyscraper is built with Carnegie steel. But despite his newfound wealth making him one of the richest men in America, Rockefeller is still worth seven times more than Carnegie. He hires Henry Frick, a self made millionaire by 30, one of the Midwest’s largest coal suppliers and a ruthless businessman. In two years, Frick doubles Carnegie’s profits. To celebrate, Frick sets up a resort for the super-rich: the South Fork Fishing and Hunting Club and his business partner is soon one of its members. It is in a superb location, situated near the South Fork dam. This dam holds 20 million tonnes of water. Fourteen miles downriver sits Johnstown. Frick orders the dam lowered (in order to make it possible for his carriage to travel along the top) and the reservoir water level to be raised. This, combined with one day’s heavy rainfall on 31 May 1899, that pushes the water level up by an inch every ten minutes, these actions prove fatal. The dam bursts and more than 2,000 people are killed. One in three are so mutilated that they are never identified. 16,000 homes are destroyed and four square miles are levelled. The recently formed Red Cross is called. It’s the worst manmade disaster in American history, prior to 9/11. Members of The South Fork are sued, unsuccessfully. But Carnegie feels responsible and donates millions to rebuild Johnstown. Despite Rockefeller still being worth three times more than Carnegie, the Scotsman donates ever increasing amounts of his fortune. Carnegie invests millions to turn around the Homestead Steel Works, a struggling steel mill outside Pittsburgh, to increase the production of structural steel. But to cut costs, Carnegie allows Frick to increase working hours and reduce wages. When the newly formed unions start opposing 12 hour days and six day weeks, and the subsequent workplace injuries and fatalities, Frick writes to Carnegie asking for permission to crush them. In the wake of the Johnstown tragedy, Carnegie has retreated to his homeland, Scotland, and essentially leaves it to Frick. Frick stockpiles steel in preparation for a strike. He brings in the Pinkerton Detectives, a private army willing to track down train robbers, guard the President and break strikes. In 1892, two thousand workers barricade themselves inside the Homestead plant, stopping steel production. In the escalating tension, The Pinkertons fire on the unarmed workers. Many are shot in the back as they run for their lives. Nine are killed. The strike is broken, but not until the state governor sends in the state militia. Frick, seen as the cause of the trouble, is shot and stabbed by an anarchist assassin. But three days after this attempted assassination, he’s back at work and moreover, hustling to take the steel plants away from Carnegie. He fails and Carnegie instructs his board to eject Frick. JP Morgan approaches Carnegie and asks him to sell. At a dinner party, Carnegie writes out four hundred and eighty million on a piece of paper. The equivalent today of four hundred billion dollars, or the entire budget of the US Federal Government. In modern terms Carnegie has amassed a personal fortune of over $310 billion. The largest private fortune the world has ever seen. 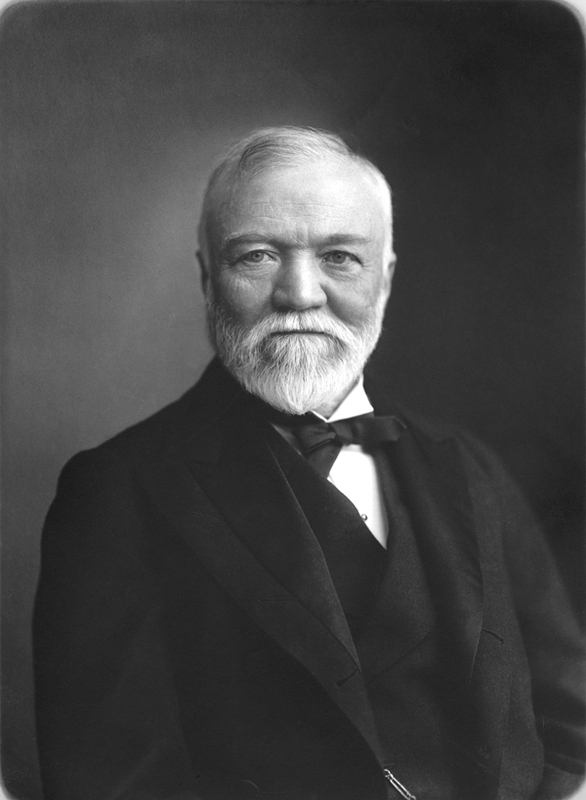 Carnegie spends the rest of his life giving away more than 350 million dollars, or 67 billion in today’s money. But despite his charitable efforts, the tragedies of Johnstown and Homestead were associated with his name until his death, from bronchial pneumonia, in 1919.